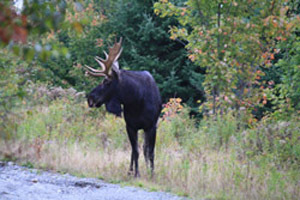 Show me an example Maine Moose Tracks - Greenville Maine Moose Watching Tours: Best Family Vacation Idead While in Maine! Last night, we had a private moose tour go out for a big family of 8! It was nice and warm outside, but not much sun was shining. The family was really excited for their tour, because none of them had ever seen a moose before. While on their moose tour, the family saw a total of three moose, two on the pond and one on the ride home. The family also got to see other great wildlife that Maine has to offer such as deer, loons, and hares. The kids in the family were so excited about the tour and so happy when they got to see moose! We're glad the family had so much fun with us!